T&D Engineers worked with Turner Partners Architecture for the design of this 20,000 square foot office space, encompassing the 21st floor of the 919 Milam building in downtown Houston. The space included a mix of open office space and private offices, including an executive area complete with private coffee area and board room. The design incorporated the latest system upgrades for the building, including a full floor lighting control system and ultra-low wattage T8 lighting. 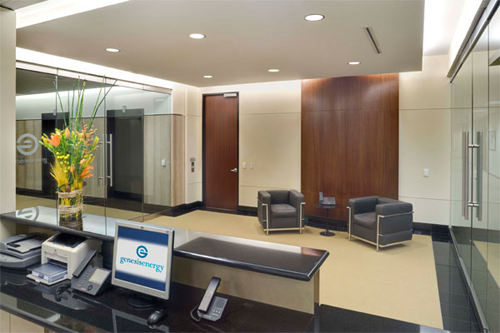 The result is a simple and graceful space that meets the needs of Genesis Energy.